Our Fashion Adhesive Kit contains double sided tape that really does the job, it also includes alcohol swabs for preping the area before you attach the tape to skin. The Fashion Tape Kit. 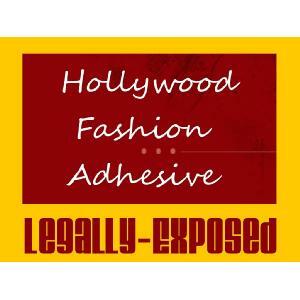 Hollywood uses this tape to prevent wardrobe malfunctions, hold bra straps in place, keep blouse from opening, etc. Contains: Adhesive tabs, alcohol swabs and instructions. The tape tabs are Medical Grade and Hypoallergenic.. They usually can be re-used many times. You can use directly to hold material to material or skin to material. If attaching to skin: Clean the skin area first with an alcohol swab. Remove one side of the tape protective paper, apply in place. Remove the other side of the protective paper and apply.